Our understanding of the processes of nucleotide substitution (DNA sequence evolution) has been expanding greatly over the last 10 years. Furthermore, it has become apparent that ignoring such processes as heterogeneity of base composition, substitution pattern, and rate variation among nucleotide sites can compromise attempts to estimate phylogeny from DNA sequence data. Therefore, model-based analyses of DNA sequence data have become increasingly wide spread because such approaches afford the investigator the opportunity to account for such processes explicitly. *Hoissington, J. L., L. P. Waits, and J. Sullivan. 2012. Species limits and integrated taxonomy of the Idaho ground squirrel (Urocitellus brunneus): Genetic and ecological differentiation. Journal of Mammalogy. In Press. Francia, M. E., S. Wicher, D. A. Pace, J. Sullivan, S. N. J. Moreno, and G. Arrizabalaga. 2011. A Toxoplasma protein with homology to intracellular type sodium hydrogen exchangers is required for osmotolerance and protein processing. Experimental Cell Research. 317:1382-1396. *Reid, N., J. R. Demboski, and J. Sullivan. 2011. Phylogeny estimation of the radiation western American chipmunk (Tamias) in the face of introgression using reproductive protein genes. Systematic Biology. In Press. doi: 10.1093/sysbio/syr094. *Evans, J. and J. Sullivan. 2011. Generalized mixture models for molecular phylogenetic estimation. Systematic Biology. In Press. doi: 10.1093/sysbio/syr093. *Evans, J. and J. Sullivan. 2010. Approximating model probabilities in BIC and DT approaches to model selection in phylogenetics. Molecular Biology and Evolution. 28:343-349. doi:10.1093/molbev/msq195. *Ripplinger, J. and J. Sullivan. 2010. Assessment of substitution-model adequacy using frequentist and Bayesian methods. Molecular Biology and Evolution. 27:2790- 2803. doi:10.1093/molbev/msq168. *Ripplinger, J., Z. Abdo, and J. Sullivan. 2010. Effects of parameter estimation on maximum-likelihood bootstrap analysis. Molecular Phylogenetics and Evolution, 56: 642-648. *Hird, S., N. Reid, J. R. Demboski, and J. Sullivan. 2010. Introgression at differentially aged hybrid zones in red-tailed chipmunks. Genetica, 138:869-883. doi:10.1007/s10709-010-9470-z. McPeek, M. A., D. L. DeAngelis, R. G. Shaw, A. J. Moore, M. D. Rausher, D. R. Strong, A. M. Ellison, L. Barrett, L. Reisberg, M. D. Breed, J. Sullivan, C. W. Osenberg, M. Holyoak, and M. A. Elgar. 2009. The golden rule of reviewing. The American Naturalist, 173: E155-E158. Swofford, D. L. and J. Sullivan. 2009. Phylogenetic inference using parsimony and other methods using PAUP*. Pp. 260-312 In (P. Lemey, M. Salemi, A.M. Vandamme, eds.). The Phylogenetic Handbook, Second Edition. Cambridge University Press, Cambridge, UK. *Ripplinger, J., and J. Sullivan. 2008. Does choice in model selection affect maximum likelihood analysis? Systematic Biology. 57:76-85. *Good, J., *S. Hird, *N. Reid, J. Demboski, S. Steppan, and J. Sullivan. 2008. Ancient introgression and mtDNA capture in non-sister species of chipmunks (Tamias). Molecular Ecology. 17:1313-1327. DOI: 10.1111/j.1365-294X.2007.03640.x. Nagler, J. J., T. Cavileer, J. Sullivan, D. G. Cyr, and C. Rexroad III. 2007. The complete estrogen receptor family in the rainbow trout: discovery of novel ER2 and both ER isoforms. Gene, 392:164-173. *Nielson, M, K. Lohman, C. H. Daugherty, F. W Allendorf, K. L. Knudsen, and J. Sullivan. 2006. Allozyme and mitochondrial DNA variation in the tailed frog (Anura: Ascaphus): The influence of geography and gene flow. Herpetologica. 62:235-258. Brunsfeld, S. J., and J. Sullivan. 2006. A multi-compartmented glacial refugium in the northern Rocky Mountains: Evidence from the phylogeography of Cardamine constancei (Brassicaceae). Conservation Genetics, 6:895-904. *Carstens, B.C., J. R. Demboski, *J. M. Good, S. J. Brunsfeld, and J. Sullivan. 2005. The evolutionary history of the northern Rocky Mountain mesic forest ecosystem. Evolution. 59:1639-1652. Sullivan, J. and P. Joyce. 2005. Model selection in phylogenetics. Annual Review of Ecology Evolution & Systematics, 36:445-466. *Carstens, B.C., A. Bankhead III, P. Joyce, and J. Sullivan. 2005. Testing population genetic structure using parametric bootstrapping: The Migrate-n test of population structure. Genetica, 124:71-75. *Steele, C. A., *B. C. Carstens, A. Storfer, and J. Sullivan. 2005. Testing hypotheses of speciation timing in Dicamptodon copei and Dicamptodon aterrimus (Caudata: Dicamptodontidae). Molecular Phylogenetics and Evolution, 36:90-100. Sullivan, J., *Z. Abdo, P. Joyce, and D. L. Swofford. 2005. Evaluating the performance of a successive-approximations approach to parameter optimization in maximum-likelihood phylogeny estimation. Molecular Biology and Evolution, 22:1386-1392. *Abdo, Z., V. Minin, P. Joyce, and J. Sullivan. 2005. Accounting for uncertainty in the tree topology has little effect on the decision theoretic approach to model selection in phylogeny estimation. Molecular Biology and Evolution, 22:691-703. Sullivan, J. 2005. Maximum-likelihood estimation of phylogeny from DNA sequence data. In (E. Zimmer & E. Roalson, eds.) Molecular Evolution: Producing the Biochemical Data, Part B. Methods in Enzymology, 395:757-779. *Carstens, B. C., *J. D. Degenhardt, *A. S. Stevenson, and J. Sullivan. 2005. Accounting for coalescent stochasticity in testing phylogeographic hypotheses: Testing models of Pleistocene population structure in the Idaho giant salamander Dicamptodon aterrimus. Molecular Ecology, 14:255-265. *Carstens, B. C., *A. L. Stevenson, *J. D. Degenhardt, and J. Sullivan. 2004. Testing nested phylogenetic and phylogeographic hypotheses in the Plethodon vandykei species group. Systematic Biology, 53:781-792. *Carstens, B. C, J. Sullivan, L. M. Davalos, P. A. Larsen, and S. C. Pedersen. 2004. Exploring population genetic structure in three species of Lesser Antillean bats. Molecular Ecology. 13:2557-2566. *Minin, V., *Z. Abdo, P. Joyce, and J. Sullivan. 2003. Performance-based selection of likelihood models for phylogeny estimation. Systematic Biology. 52:674-683. *Good, J. M., J. Demboski, D. M. Nagorsen, and J. Sullivan. 2003. 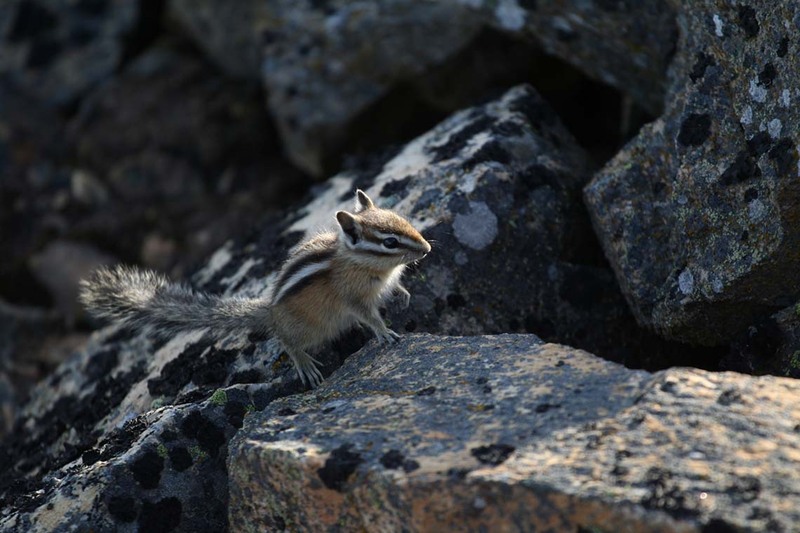 Phylogeography and introgressive hybridization: Chipmunks (Tamias) in the northern Rocky Mountains. Evolution, 57:1900-1916. Swofford, D. L. and J. Sullivan. 2003. Phylogenetic inference using parsimony and maximum likelihood using PAUP*. Pp. 160-196 In (M. Salemi, A.M. Vandamme, eds.). The Phylogenetic Handbook. Cambridge University Press, Cambridge, UK. Demboski, J., and J. Sullivan. 2003. Extreme differentiation among populations of Yellow-pine chipmunks, Tamias amoenus (Rodentia; Sciuridae). Molecular Phylogenetics and Evolution. 26:389-408. *Winchell, C. J., J. Sullivan, C. B. Cameron, B. J. Swalla, and J. Mallatt. 2002. Evaluating hypotheses of deuterostome evolution with new LSU and SSU ribosomal DNA phylogenies. Molecular Biology and Evolution. 19: 48-761. *Good, J. M., and J. Sullivan. 2001. Phylogeography of red-tailed chipmunks (Tamias ruficaudus), a northern Rocky Mountains endemic. Molecular Ecology, 10:2683-2696. Brunsfeld, S., J. Sullivan, D. Soltis, and P. Soltis. 2001. Comparative phylogeography of northwestern North America: A synthesis. Pp. 319 – 339 In (J. Silvertown and J. Antonovics, eds.) Integrating ecological and evolutionary processes in a spatial context. Blackwell Science, Oxford. Sullivan, J. and D. L. Swofford. 2001. Should we use model-based methods for phylogenetic inference when we know assumptions about among-site rate variation and nucleotide substitution pattern are violated? Systematic Biology, 50:723-729. *Nielson, M. K., K. Lohman, and J. Sullivan. 2001. Phylogeography of the tailed frog (Ascaphus truei): Implications for biogeography of the Pacific Northwest. Evolution, 55:147-160. Mallatt, J., J. Sullivan, and *C. J. Winchell. 2001. The relationship of lampreys to hagfishes: A spectral analysis of ribosomal DNA sequences. In: Major Events in Early Vertebrate Evolution: Palaeontology, Phylogeny, and Development. (P. E. Ahlberg, ed.). Pp. 106-118. Taylor and Francis, London. *Harris, D. J., D. S. Rogers, and J. Sullivan. 2000. Phylogeography of Peromyscus furvus (Rodentia: Sigmodontinae) based on Cytochrome b sequences. Molecular Ecology, 9:2129 - 2136. Sullivan, J., *E. A. Arellano, and D. S. Rogers. 2000. Comparative phylogeography of Mesoamerican highland rodents: Concerted versus independent responses to past climatic fluctuations. The American Naturalist, 155:755-768. Steppan, S. J., and J. Sullivan. 2000. The emerging statistical perspective in systematic biology: A reply to Mares and Braun on the status of Andalgalomys (Rodentia: Sigmodontinae). Journal of Mammalogy, 81:260-270. Waits, L., J. Sullivan, S. J. O’Brien, and R. Ward. 1999. Mitochondrial DNA phylogeny for bears: single region trees and combined data trees. Molecular Phylogenetics and Evolution, 13:82-92. Sullivan, J., D. L. Swofford, and G. J. P. Naylor. 1999. The effect of taxon sampling on estimating rate-heterogeneity parameters of maximum-likelihood models. Molecular Biology and Evolution. 16:1347-1356. Mallatt, J., and J. Sullivan. 1998. 28S and 18S rDNA sequences support the monophyly of lampreys and hagfishes. Molecular Biology and Evolution, 15:1706-1718. Sullivan, J. and D. L. Swofford. 1997. Are guinea pigs rodents? The importance of adequate models in molecular phylogenetics. Journal of Mammalian Evolution, 4:77-86. Sullivan, J., J. A. Markert, and C. W. Kilpatrick. 1997. Phylogeography and molecular systematics of the Peromyscus aztecus group (Rodentia: Muridae) inferred using parsimony and likelihood. Systematic Biology, 46:426-440. Frati, F., C. Simon, J. Sullivan, and D. L. Swofford. 1997. Evolution of the mitochondrial cytochrome oxidase II gene in Collembola. Journal of Molecular Evolution, 44:145-158. Sullivan, J. 1996. Combining data with different distributions of among-site rate variation. Systematic Biology, 45:375-380. Simon, C., L. Nigro, J. Sullivan, A. Franke, A. Grapputo, A. Martin, and C. McIntosh. 1996. Large among-taxon differences in the 12S rRNA gene: Implications for the molecular clock. Molecular Biology and Evolution, 13:923-932. Sullivan, J., K. E. Holsinger, and C. Simon. 1996. The effect of topology on estimates of among-site rate variation. Journal of Molecular Evolution, 42:308-312. Hickson, R. E., C. Simon, A. J. Cooper, G. Spicer, J. Sullivan, and D. Penny. 1996. A refined secondary structure model, conserved motifs, and alignment for the third domain of animal 12S rRNA. Molecular Biology and Evolution, 13:150-169. Sullivan, J., K. E. Holsinger, and C. Simon. 1995. Among-site rate variation and phylogenetic analysis of 12S rRNA in sigmodontine rodents. Molecular Biology and Evolution, 12: 988-1001. Sullivan, J. M. and C. W. Kilpatrick. 1991. Biochemical systematics of the Peromyscus aztecus assemblage. Journal of Mammalogy, 72:681-689. Sullivan, J. M., C. W. Kilpatrick, and P. D. Rennert. 1991. Biochemical systematics of the Peromyscus boylii species group. Journal of Mammalogy, 72:681-696. Phylogenetic analysis, the estimation of evolutionary trees, has become the cornerstone of evolutionary biology. In addition to their more traditional applications in evolutionary biology, molecular phylogenies (i.e., phylogenies that have been estimated from molecular data such as DNA sequences) are being applied to an ever-widening array of disciplines. These include biomedicine (e.g., tracing infection pathways for HIV and other pathogens), bioinformatics (e.g., genome evolution), and forensics (phylogenies estimated from HIV sequences have recently been allowed as evidence in murder trial). Because of this, the development and testing of phylogenetic methods assumes a position of critical importance and extremely broad relevance. Furthermore, the influx of molecular sequence data and the adoption of an explicitly statistical approach to data analysis have led to the requirement to refine methods of phylogenetic inference. This project surveys genetic diversity in multiple elements of mesic forests of the Pacific Northwest in the context of explicit biogeographic and landscape hypotheses that make testable genetic predictions. The general objectives of this research are to differentiate the influence of past geological and climatic events from current landscape level processes on the geographic structure of genetic variation in several codistributed highland forest species. Determining the frequency and genetic impact of hybridization during animal speciation remains a central and unresolved issue in evolutionary biology. If reproductive isolation is incomplete when nascent species come into contact, even moderate gene flow may result in population fusion. Thus, recurrent hybridization among animal species has traditionally been viewed as rare. Alternatively, genetic factors underlying speciation may continue to accumulate between divergent populations despite on-going gene flow, eventually leading to the evolution of complete reproductive isolation. Consistent with this second model (divergence with gene flow), several recent studies have shown that closely related taxa may retain differentiation despite high levels of cryptic hybridization and introgression. The radiation of western American chipmunks (Tamias, subgenus Neotamias) represents an excellent study system for diversification with gene flow. Thus, we are estimating the phylogeny of the genus using a diverse array of data sets, including mtDNA, ncDNA.